The Storefront Safety Initiative was launched by the Storefront Safety Council in 2017 to work together to put an end to vehicle-into-building crashes. ​ Our data shows that every year in the United States there are as many as 20,000 crashes into stores, offices, bus stops, shopping centers, post offices, restaurants, and storefronts. More than 4,000 pedestrians, patrons and employees are severely injured each year, and tragically preliminary data shows as many as 500 deaths result from these largely preventable accidents. ​The objective of Storefront Safety Initiative (SSI) is to provide free resources to those working to increase pedestrian safety where we eat, work, play & shop. We work with industry and government officials to educate and promote building codes. We are doing this by increasing the participation of business owners, property owners, developers, design professionals, and public servants. We believe that implementation of common sense standards of care will help to prevent the substantial loss of life. 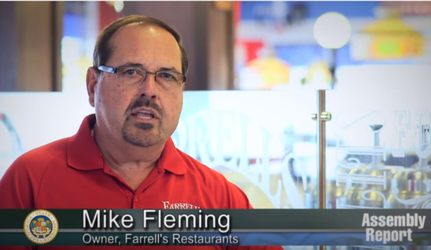 VIDEO: Pedal error tragedy at Farrell's becomes state safety legislation. "Safer Parking." Simple, affordable, solutions that protect people and places. Launched in 2017, "Safer Parking" is a solution-based effort led by experts from various fields. Our aim is to provide resources to help property owners, store owners, local officials, and the public to identify drive aisle hazards and address the problems with simple and affordable solutions. Our research has shown that a large number of accidents at storefronts and shopping centers are a result of poor parking lot design that is actually very simple and inexpensive to correct. "Drive aisle" is the term most often used for the lanes that cars drive down when entering or exiting parking lots. Many older centers, and some newer ones with design limitations, have arranged parking spaces and drive aisles in a manner that results in oncoming vehicles being pointed directly at store entrances. This can have disastrous consequences. Vehicles under acceleration will always proceed directly forward unless the driver turns the wheel or steps on the brake. Too often in America, there are accidents where the driver, for whatever reason, fails to turn or brake, with the the result that vehicles end up inside of stores, injuring and killing pedestrians, customers and employees. The Storefront Safety Council and the participants in the Storefront Safety Initiative are working to increase parking lot and storefront safety wherever Americans work, play and shop. Watch for updates from the Storefront Safety Council about the Storefront Safety Initiative's "Safer Parking " effort. Use the button below to contact an expert solution provider.